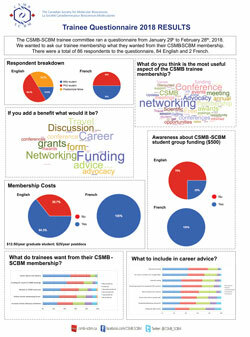 The CSMB works to build the next generation of researchers for academia, industry and the entrepreneurial enterprise. Scientific Symposium Days, with invited scientists speaking on subjects in the areas of biochemistry, molecular biology or cell biology. Student Research Conferences, where students display their research work as posters, or give oral presentations. Career Fairs or Career Workshops in areas related to biochemistry, molecular biology or cell biology. The society will support up to six events each year, to a maximum of $500 per event, on a competitive basis. Student organizations seeking financial support under this program should contact the society Secretary (see below). provide a letter from the Sponsor/Coordinator who is a Regular Member of the Society, working with the Student Organization. Requests will be accepted twice each year (up to 3 possible awards for each competition), with deadlines of February 15 and September 15. Priority will be given to applications that fulfill the review criteria and were not funded in the previous year. Does the conference/symposium engage a wider community or mostly local/departmental attendees? Level of student involvement in the organization? Potential to bring together trainees or who do not usually engage with each other? Potential for new connections? Potential to open new “horizons” for trainees (for example if it is a workshop or other conference that places more emphasis on the learning than the research presentations by trainees). Value in training students and postdocs? Equality, diversity, inclusivity e.g., is there gender balance in speakers?